Open your design horizons with new units and reinforcements. Veteran Hastati, the elite Extraordinarii, Carthaginian Spearmen and mercenary archers are ready to join the forces of Rome and Carthage. 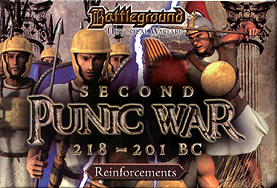 This set is an expansion for the Second Punic Wars basic set. It includes 50 additional units for each army and a scenario book with army lists, maps and special rules to recreate battle like Cannae, Trebia, Trasimene and Zama. Battleground: Historical Warfare is a point-based tabletop tactical wargame in which units are represented by cards instead of a collection of figures or models. It is fully compatible with Battleground: Fantasy Warfare.